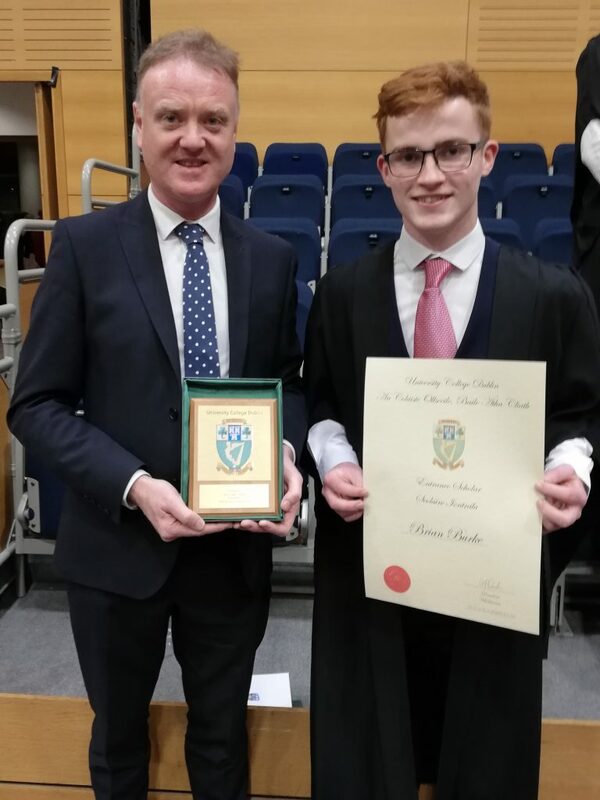 The SVP Conference of De La Salle College launch of the new Conference of 2018 took place on Thursday 15th November. The Conference set up their stand in the College canteen. They met students during the lunch time break. The new Conference of 15 members were very well received by their fellow students, Brothers and teachers. 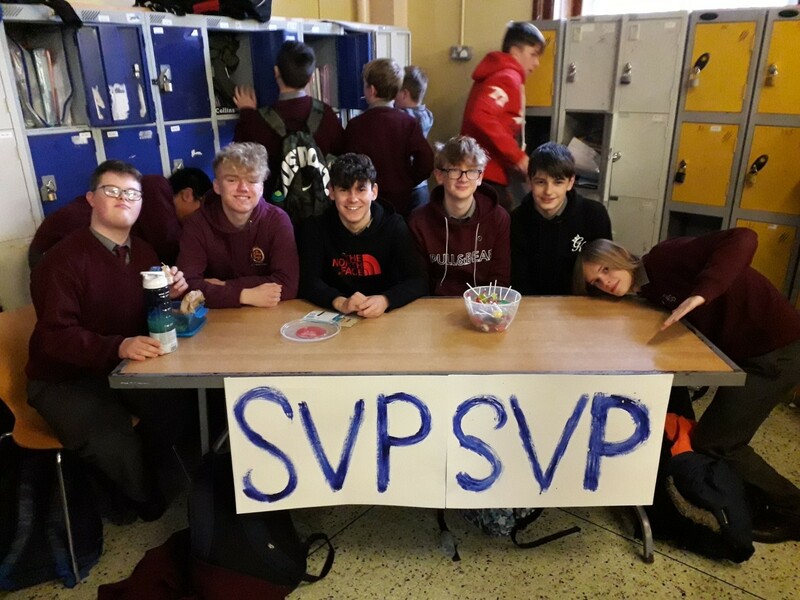 They are looking forward to their involvement with SVP in the coming year. 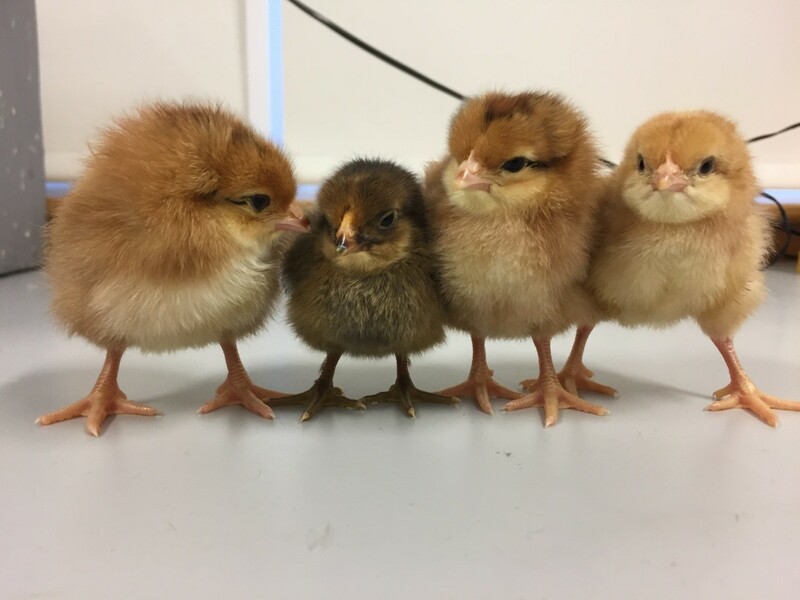 There was great excitement in the Science Department in De La Salle College last week as four baby chicks hatched in time for Science Week. The eggs, supplied by Nore Valley Farm in Kilkenny, were incubated for 21 days and hatched last Thursday. The chicks are being cared for by the students at present, and will return to Nore Valley Farm when they get a little bigger. 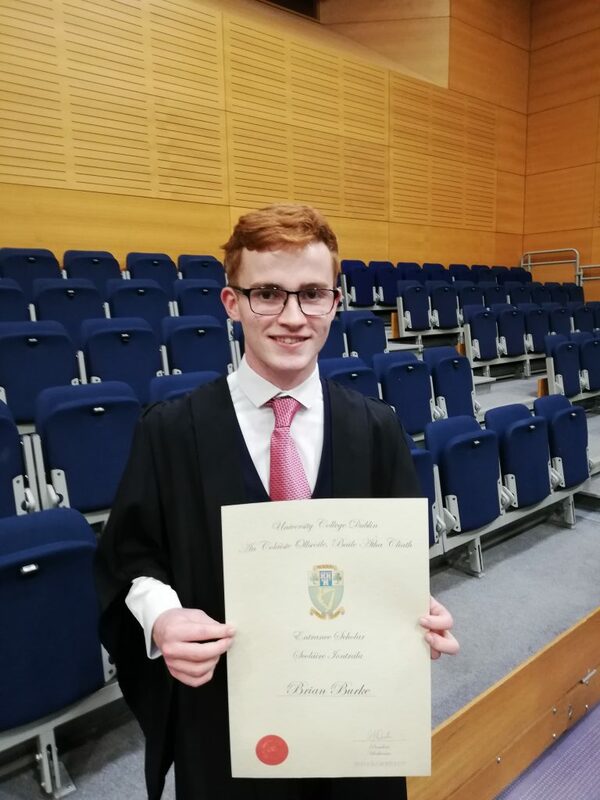 Congratulations to Brian Burke a past pupil of De La Salle college who received an entrance scholarship award from UCD based on his outstanding Leaving Certificate results. 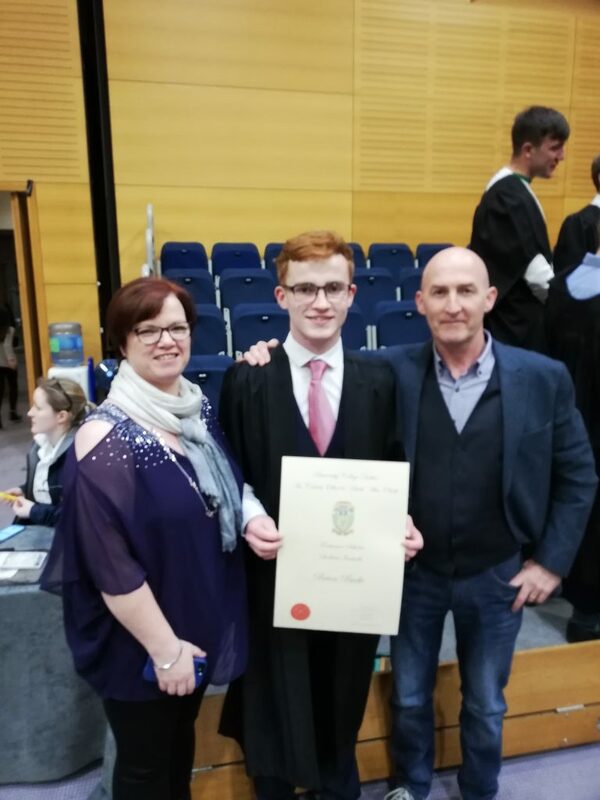 Brian is currently studying Engineering in UCD. Congratulations to Brian from all the staff in De La Salle on this great achievement. Why study Leaving Leaving Certificate Accounting? Accounting is a business studies option within the Leaving Certificate programme. It covers aspects of business and social life which are not dealt with in any other subject in that programme. It is concerned with the preparation, recording, extraction, presentation and analysis of financial information for the purpose of making economic decisions. The course also involves a Management Accounting section where the student will learn how to analyse business costs and how to prepare budgets. Once you can understand and adhere to the basic rules of accountancy, it is a subject that you can do very well in. The subject is examined at higher and ordinary level. Both levels involve one exam of three hours duration, 400 marks. The exam paper is made up of three sections, the first two are based on the Financial Accounting section of the course and the third covers the Management Accounting section. Questions must be answered from all sections of the exam paper. Accounting provides a valuable foundation for all business functions and many top executives have an accountancy background. Career pathways might include accountancy, actuarial studies, teaching, banking, clerical and administration roles, insurance, marketing, sales, retail, taxation, purchasing, general business or finance. It would also be an important subject choice for those thinking of starting their own business. The course is numerically based but theory and procedures must be learned also.While the student needs to be comfortable with numbers he does not need to be at higher maths level. While the Junior Certificate Business Studies Course provides a foundation for this course, it is not essential and it is possible to take accountancy up at senior cycle.This course offers a hard working student the real possibility of high grades because of the unambiguous nature of the questions. An organised student who likes order will be particularly suited to this course. Agricultural Science is the study of the science and technology behind the principles and practices of agriculture. It is a 2 year course with a maximum of 24 students per class. The published syllabus has remained unchanged for many years. It is examined at two levels – ordinary and higher level. There is little difference in the content between the levels. The examination consists of a terminal written paper worth 75% and a practical coursework component worth 25%. A written report on practical experience gained with 2 crops, 1 livestock enterprise and field and farmyard layout maps. Practical experience must be gained on a farm over the 2 year period so access to a farm (home or adopted) is essential. Laboratory investigations carried out and written up relating to ecology, soil science, animal physiology, plant physiology, genetics and microbiology. The exam paper consists of 9 long questions of which 6 must be answered. Students should have a genuine interest in Science. It is preferable for students to have studied Science at higher level for their Junior Certificate. Students must be willingly to visit a farm(s) on a number of occasions to complete the practical component of their assessment so, access to a farm on a regular basis is essential. Students must have an inquisitive mind and a desire to know why things work as they do. Should I take up agricultural science for the leaving certificate? You are good at junior certificate science. You have an interest in farming or a career in the agricultural sector. You are also doing Biology or Geography as there is some overlap in content. You have access to a farm or live on a farm, upon which you can complete the practical component. You enjoy practical work and are good at writing projects and reports. Biology is the study of life. Through the study of biology students employ the processes of science in their investigations and explore the diversity of life and the inter-relationship between organisms and their environment. It is a 2 year course with a maximum of 24 students per class. Biology is examined at two levels – ordinary and higher level, which are differentiated on the basis of range of topics (an extended range is topics is required at higher level) and depth of treatment (at higher level a deeper and more quantitative treatment of biology is required). Higher level students are expected to have a good scientific literacy and use biological terminology fluently. Answers are expected to be clear, detailed, logical and concise. Students should have a genuine interest in and aptitude for science. The examination consists of a 3 hour written paper (worth 100%) and is divided into three sections. Section A is worth 25% of the marks. It contains mainly shorter style questions. Students must answer 5 questions from 6 in this section. Section B is based on the 22 mandatory experiments and is worth 15%. Students answer 2 questions from 3. Note: Students must maintain a written report of all experiments. The reports must be available for inspection at all times. The State Examinations Commission has the authority to prevent a student from sitting the written paper if they fail to produce a complete set of laboratory reports. Section C (60%) consists of long questions where a lot of detail is required in student answers. Students will be asked to draw and label anatomical diagrams. You have an interest in the study of life and the inter-relationship between organisms and their environment. You require a science subject for entry to a third level course. Chemistry involves a problem solving approach to the world of chemicals, atomic structure, how and why different chemical reactions occur, the rates at which reactions occur and the history of the atom and the periodic table. It is a 2 year course with a maximum of 24 students per class. It is examined at two levels – ordinary and higher level. Chemistry also involves practical work where students carry out 28 mandatory experiments and record and analyse the data collected, drawing conclusions about what the student has observed in the process. All mandatory experiments must be recorded and be available for inspection. The examination consists of a 3 hour written paper (worth 100%) and is divided into two sections. Section A questions students on 3 of the 28 mandatory experiments which students carry out over the course of the two year Leaving Certificate programme. Section B questions students on concepts in chemistry and tests students’ ability to apply these concepts in solving chemistry related problems. It is imperative that students have a genuine interest in and aptitude for science. It is preferable for students to have studied and passed science at higher level for their Junior Certificate. It is preferable for students to be competent and comfortable with mathematics. Chemistry will appeal to those who have good analytical and practical skills. Chemistry offers opportunities for those who would like to carry out investigative laboratory work such as forensics or in a medical or pharmaceutical laboratory. Chemistry is a gateway to a wide variety of careers such as Medicine, Pharmacy and Pharmaceutical science, Physiotherapy, Dentistry, Biomedical Engineering, Genetics and many more exciting careers. Hard-working and capable candidates are rewarded in chemistry. At higher level each year, approximately 11% of candidates secure a H1, and 28-29% of candidates secure a H1 or a H2. If you are interested in using laboratory tests to identify unknown compounds, creating chemical reactions, learning how everyday chemicals are made and used, then chemistry could be for you. Chemistry is a compulsory requirement for a number of third level courses including Medicine, Pharmacy, Dentistry, and Dietetics. Chemistry is also strongly recommended for all science and engineering courses. What do I need to do this course? Having studied Materials Technology Wood at Junior Cycle is important but not vital. A good knowledge of Technical Graphics is also a very beneficial prerequisite to Construction Studies. Construction Studies is assessed at both Ordinary level and Higher level by means of a terminal examination paper (50%), a practical test (25%) and a student project (25%). A revised syllabus, with the title Architectural Technology, has been prepared, but funding hasn’t currently made available to proceed with implementation.